Today I sit at my computer and mentally prepare for the next 10 weeks. I LOVE having my kids at home, but I also have things that need done and I am accustomed to fitting them in with less children in tow. This means that I have to strike a balance between conquering my list and really enjoying the moment. This is totally doable. Many women have gone before me and owned their summers while keeping on top of work (be that housework or vocational work). I am blessed to work from home so I am doing both under one roof. 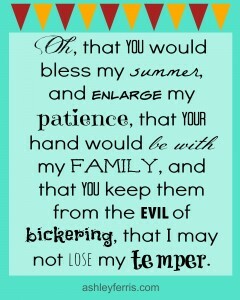 For all the moms out there preparing for the adventures of summer, I give you my summer prayer. 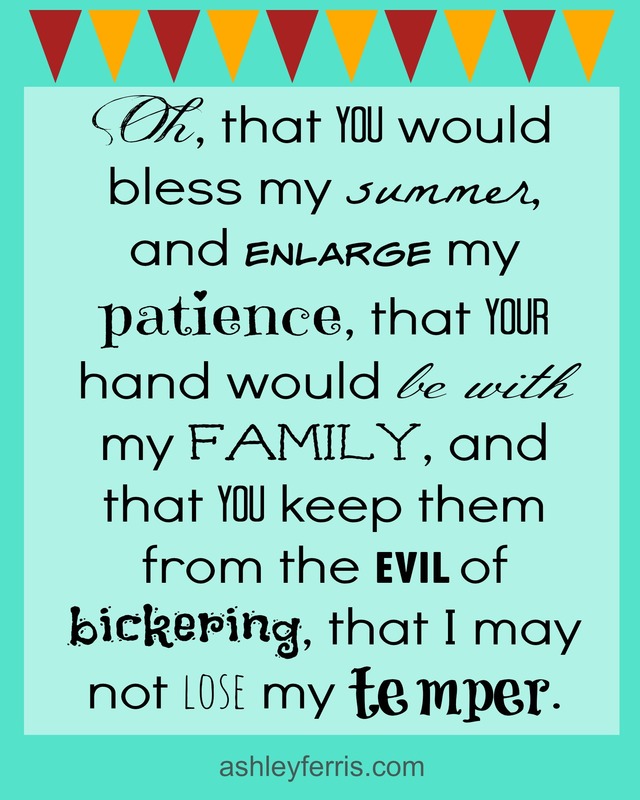 I looked at the prayer of Jabez and thought, what would it look like to ask God for an amazing summer? Throughout this summer do not forget where your strength comes from. When the excitement of freedom wanes and boredom beckons your kids to whine, remember that this is an opportunity to strengthen their problem solving skills…and your patience. These days will be some of the best days of our lives. We will catch some of that now and realize it more fully later. Ask God for the most aware perspective you can handle in the moment. Ask boldly for the power of Holy Spirit to help you navigate the harder times. And don’t beat yourself up if you are longing for August in the middle of June. This parenting gig is not all roses, and we are not less holy if we have a string of days where we don’t jump out of bed with a smile on our face and pour milk for cereal like it was what we were created to do. I just hope that you know where you need to go when those days come. Take time to make sure you get in the Word. Spend time worshiping. This will lighten your heart in those moments. Pray and do spiritual warfare for those little ones in your life that are victim to the Enemy without even knowing it. We are not powerless to the season of less structure. We have great opportunity to rest, make memories, and see our kids in the moment.